When I think of camping gear and clothing, Aldi isn’t the first company that springs to mind. Or the second. But then I saw an ad that said they had a camping sale, and I was like, “what? Aldi? Don’t they just sell groceries?” They do sell groceries, so I was right on that front, but they also have sales of camping gear as part of their Special Buys catalogue. From looking through the catalogue, Aldi are appealing to the camping enthusiast who is looking for reasonably priced items. If you are new to camping, then these items could definitely appeal – you get to try camping, without spending a great deal of money. When Aldi suggested I try out their Aldi 3-in-1 Jacket, I wasn’t sure what to expect. But, as I feel the cold (a lot), I was interested to see if it could keep me warm on a cold night on the River Murray! The jacket is meant to be waterproof, windproof and breathable – all 3 things you need around the campsite. Time to road test the jacket. We chose a weekend when it was overcast and windy. Then the rain set in. So it wasn’t the most ideal weekend to be out camping……. To me, wind is worse than rain when outdoors. It can really chill you, so a shell of a jacket that can reduce that chill factor is very important. I used the shell of this jacket in conjunction with the inner fleece and it did significantly reduce the effects of the breeze for me. The tag says the jacket is breathable up to 8000g/ m² /24h (this is a guide to how many grams of moisture vapor can pass through a square metre of fabric in a single day. The higher the rating – the more breathable the fabric). What does that mean for everyday camping fans – good for light work around the campsite (not for a serious workout though!). Without the jacket on, the wind felt like it was going right through me. I put the jacket back on very quickly. 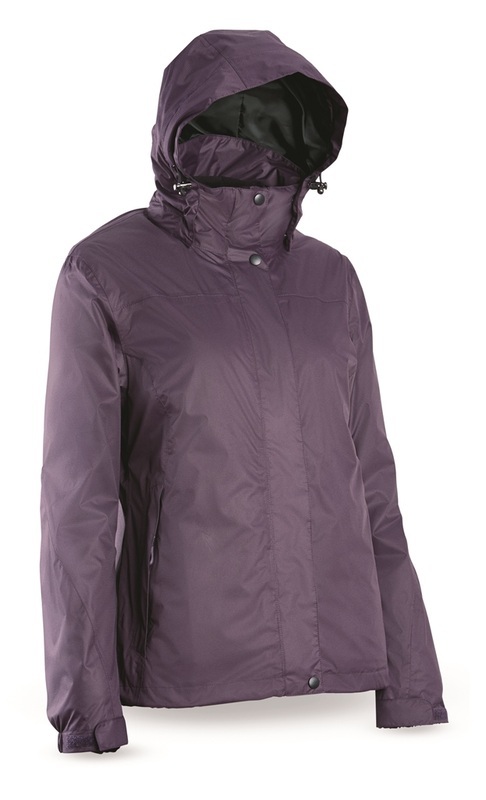 This Aldi jacket is meant to be waterproof up to 12,000mm, which seems pretty impressive for a jacket like this. That number means the jacket can withstand 12,000mm of rainfall in a single day without letting moisture in. I don’t want to camp anywhere where that amount of rain is expected. Moderate rain needs a waterproof rating about 10,000-16,000mm, so this will definitely suit most camping rain situations. How they measure this sort of thing is a mystery, so I tend to err on the side of the manufacturers giving a high rating, as it is better. I have to say, when we went camping, the rainfall was about 5mm in a single day! So the jacket certainly did withstand that deluge! Another important feature to look for in any jacket saying its waterproof is the seams. Stitched seams mean a compromise to waterproofing, so therefore outwear must have taped or sealed seams to prevent leaks. Welded seams are bonded using heat and pressure, and this jacket we are reviewing, has heat sealed seams. The zippers have storm flaps to prevent water entering from the front of you, and there are 2 pockets. Also the outer shell has Velcro tabs around the wrists. Sometimes I would just prefer the manufacturers to have elasticized sleeves, as opposed to Velcro. I just find it fiddly, and other fabrics get caught in it over time, reducing its “Sticking” ability. A good generous hood (detachable) is also included. I don’t like jackets that have these tiny hoods that only cover half a head (not that I have a big one), but this one DID cover my not-enormous head! This was very comfortable lining jacket. I wore it with the outer shell as well, and together, I stayed comfortable and warm for the trip. You can zip this fleece jacket out of the outer shell and wear it on its own! I admit I was skeptical about this jacket – but I was pleasantly surprised at it performance, style and functionality. It’s a good jacket to wear not only around the campsite, but really anywhere you need to keep warm and dry. It’s not a high performance jacket – but one that is great for everyday situations, at home or when camping. Aldi sells the jacket in male/female in 4 sizes for the $59.99 each. Aldi is located in NSW, Victoria and QLD. Note: Aldi gifted Go Camping Australia with a Ladies Jacket (medium) for the purpose of this review.